Our next new still has been released from Hunger Games Explorer. This time, it features President Snow, and head gamemaker Plutarch Heavensbee. It's great to see Philip Seymour Hoffman and Donald Sutherland in their Catching Fire roles together. We can't wait to see them on screen! The caption accomapnying this image is: "New year. New Head Gamemaker. 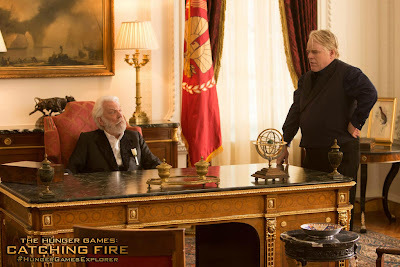 President Snow and Plutarch Heavensbee conspire in #CatchingFire"
What might they be conspiring about? Could that wooden box on Snow's desk contain the cards for the Quarter Quell? !